We can’t believe it’s already been three months since the last time we wrote about the reviews we were planning for Fall 2016. 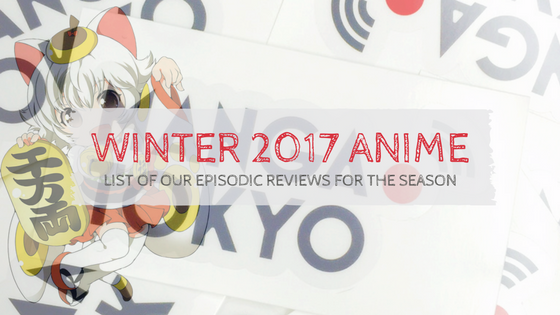 For Winter 2017, however, we decided to step it up a little and create our very first Anime Info page. We are still tweaking, fixing, and adding stuff, but our purpose is to give you a single page with all the anime of the season where you can check all the cast and staff info, watch the latest PVs, see all the key visuals, and read the series or episodic reviews. If you have any feedback or suggestions, feel free to send us a message here or at our social media: Facebook, Twitter, and Instagram. This article has a list of our review titles (which includes almost all our recommended anime from our Top 5 Anime Picks from Winter 2017) a few words about our writers, and a description of our permanent columns! Couple that with our constant coverage of all the latest anime and otaku news, and you have everything you need for a super anime winter. Little Witch Academia is one of the most anticipated anime of this season. After the success of the first animated short produced by Trigger in 2013, the team decided to partially fund the second part through Kickstarter. After a sweeping success, they animated Little Witch Academia: The Enchanted Parade. The anime will follow Akko Kagari as she enrolls into Luna Nova Magical Academy, a school for young witches. Acca 13 is adapted from a manga written and illustrated by Natsume Ono. In May 2016 the series was compiled in five tankoubon volumes. The story is set at the kingdom of Dowa, which is subdivided into 13 states. These thirteen states have many agencies that are controlled by the giant organization known as ACCA. Within ACCA, Jean Otis is the second-in-command of the inspection agency. This is a series focused on a love romance that everyone has been through. And it’s not what you often see in anime like first love, platonic love, or rom-com, but it’s about a deep and mature romance about some high school students getting twisted and crooked by it. The plot is often used in dramas, but we hardly see this kind of romance in anime. I don’t want to spoil it for you, because the story is so absurd that it’s not easy to analyze in a few sentences. It’s nonsensical and amazing. The protagonist was fond of fantasy worlds, but the one he woken up into is nothing to the one he had in mind. Both this world and his new comrades (all good looking and ridiculously strong) are just a harsh new reality he has to accept. Sukeroku Futatabi-hen is the second season of the rakugo-themed anime. A man is released from prison and becomes the apprentice of a famous rakugo performer. The story focuses on the backstories of the performers and their struggle to gain popularity. Whilst learning, he befriends another performer who has a completely different style. Perfect anime for those interested in Japanese stories and in storytelling in general. This anime is suspiciously over-hyped online. There are so many people talking about it that we were indirectly pushed to add it to our list. But, let’s be honest, what can go wrong with a show that has cute demi-human girls? The group includes a vampire, a dullahan, and a yuki-onna (snow spirit), who are attending high school and make life hard for their very normal high school teacher. This is a direct sequel to the previous season of Blue Exorcist. A-1 Pictures returns from the production so we can expect a fairly similar style. The Kyoto Arc will include five new characters. Blue Exorcist is the story of 15-year-old Rin Okumura, who, along with his younger twin brother Yukio, was raised by Father Shiro Fujimoto, an Exorcist. One day, Rin learns that he and Yukio are the sons of Satan. Witnessing Shiro dying to protect him, Rin draws the demon-slaying sword Kurikara, which restrains his demonic powers. From that moment on, Rin not only gains demonic features like fangs and a tail, but also the power to ignite into blue flames that destroy almost anything they touch. Tales of Zestiria the X was part of our Summer 2016 episodic reviews. This is the second season and it will continue exactly where it was left off. It is based on the Japanese RP game of the same name and it follows the same story. The anime has included a side story from the next game of the Tales series, Tales of Berseria, since the two are taking place in the same world but in different time. Chaos;Child is an anime adaptation of the titular visual novel game, released in 2014. It is the fourth main entry in the Science Adventure series, and a sequel to Chaos;Head (2008). Many games lately are getting the anime treatment, either with adaptations like Tales of Zestiria, or with an original story based on the game, with Danganronpa 3 being one of the finest examples. Click here for reviews of the anime Chaos;Child! 3-gatsu no Lion is part of our episodic reviews of Fall 2016. One of the most popular titles of the season, this is its second back-to-back cour. It follows the story of Rei, a professional shogi player who suffers from depression and tries to find meaning in a world that feels meaningless without the lifeboat that shogi is for him. Thanasis: Thanasis is so excited that one of his favorite SUMMER 2016 anime, Tales of Zestiria the X, is coming back that he is playing the game again to completion. This season he is also going to write his opinion on Shouwa Genroku Rakugo Shinjuu: Sukeroku Futatabi-hen, Kuzu no Honkai, and he will also continue on the second cour of 3-gatsu no Lion. Robek: Robek, on the other hand, was so disappointed that Days is not continuing for a third cour in a row that he almost decided to leave the anime kingdom to go become a footballer. We managed to keep him close and this season he will review Chaos;Child. Asie: Asie almost took her eyes off re-watching every episode of Occultic;Nine trying to find all the story hints. That’s why in this season she will take it a little more lightly and cover Little Witch Academia and Acca 13. Krismae: Krismae joined our little otaku family in Fall 2016 with Haikyuu. She was so passionate about reviewing her favorite anime that she left us no chance to argue. This seasons she is going to cover Konosuba 2 and the new Blue Exorcist. Christina: Christina is still recovering from all the deaths she witnessed last season in Mahou Shoujo Ikusei Keikaku. When she stops swinging like a pendulum while chanting curses against a character named FAV, she will start writing about Demi-chan wa Kataritai. Mokugyo loves to explore burning anime questions like the meaning behind the name of One Piece and the reasons Kimi no Na wa became such a success. Our otaku writers travel all over Japan to bring you the most exciting anime photo reports. Have you been watching your favorite anime character eating something you wished you could devour yourself? Follow our recipes of anime dishes! Most of us are not just fans. We are also creators of anime, manga, cosplay costumes, and so many more. This section want to highlight that unique side of otaku culture. We want to start the new year in the best way possible, with the most amazing reviews and all the latest news about your favorite manga and anime. Are you ready? If you want something featured on MANGA.TOKYO or if you have any kind of feedback, don’t hesitate to send us a message here or at our social media: Facebook, Twitter, and Instagram.